The 200-500 Wind Speed Dial displays wind speed from 0 to 100 mph and 0 to 160 km/hr. In addition to indicating instantaneous wind speed, the dial needle moves a gust register needle to indicate the maximum gust since the last needle reset. The 200-500 Wind Speed Dial displays wind speed from 0 to 100 mph and 0 to 160 km/hr. In addition to indicating instantaneous wind speed, the dial needle moves a gust register needle to indicate the maximum gust since the last needle reset. 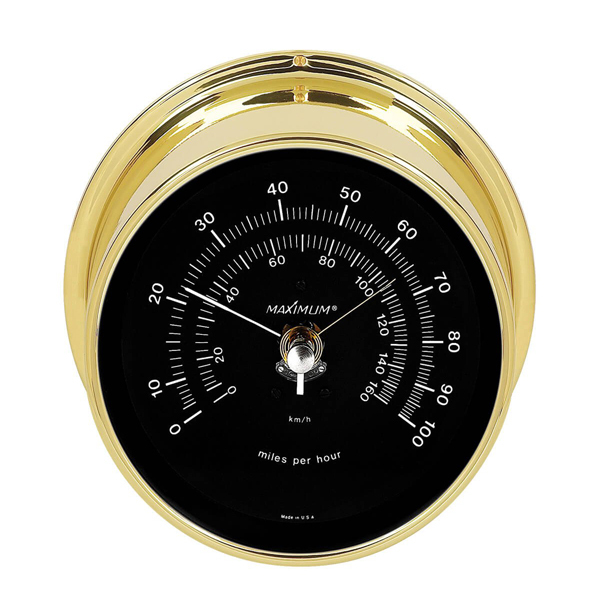 The dial face is formed from black spun aluminum, and its case is solid brass. 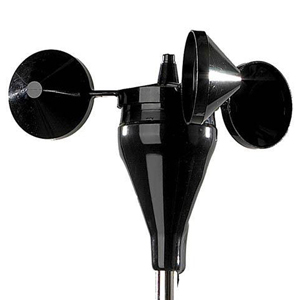 The 200-500 includes a 3-cup anemometer with an ac generator transducer. This sensor is ruggedly constructed of black lexan plastic and will withstand sunlight, ice, vibration, and winds up to 200 mph. Mounting hardware for the anemometer and 50 feet of connecting cable are included. The system provides an indicating accuracy of better than 3% of full scale.